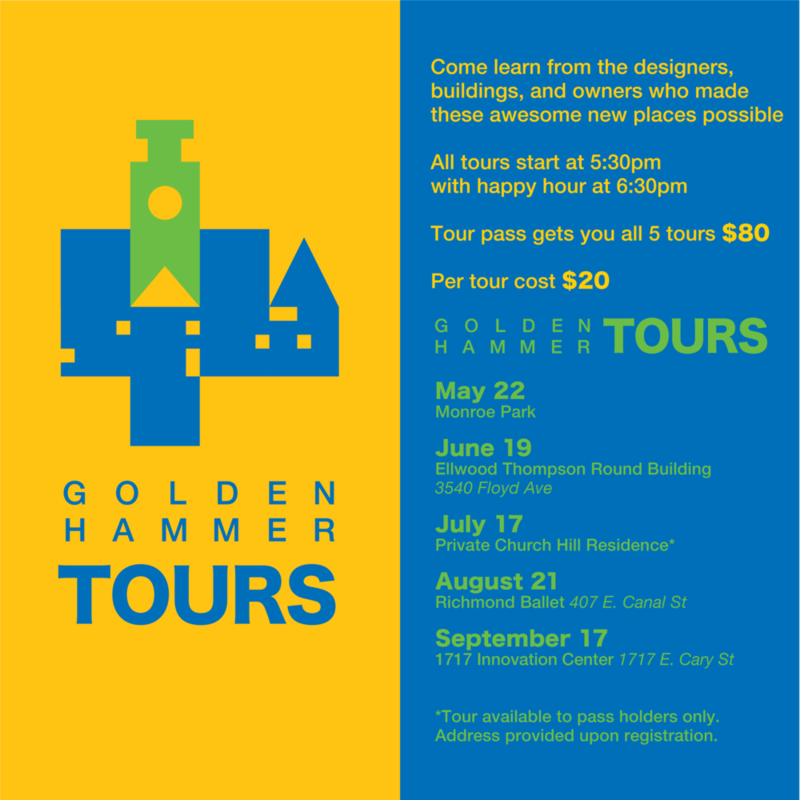 Storefront is happy to present the Golden Hammer Awards Tours which showcase winners from the 2018 Golden Hammer Awards. We invite you to join the tours if you are interested in nominating for next year’s awards (Golden Hammer 2019) and to show your support for Storefront, local designers, architecture and our city! All tours start at 5:30 pm with happy hour at 6:30pm. A tour pass gets you on all 5 tours and costs $80. Engage the Foundation seeking Interior Designer! 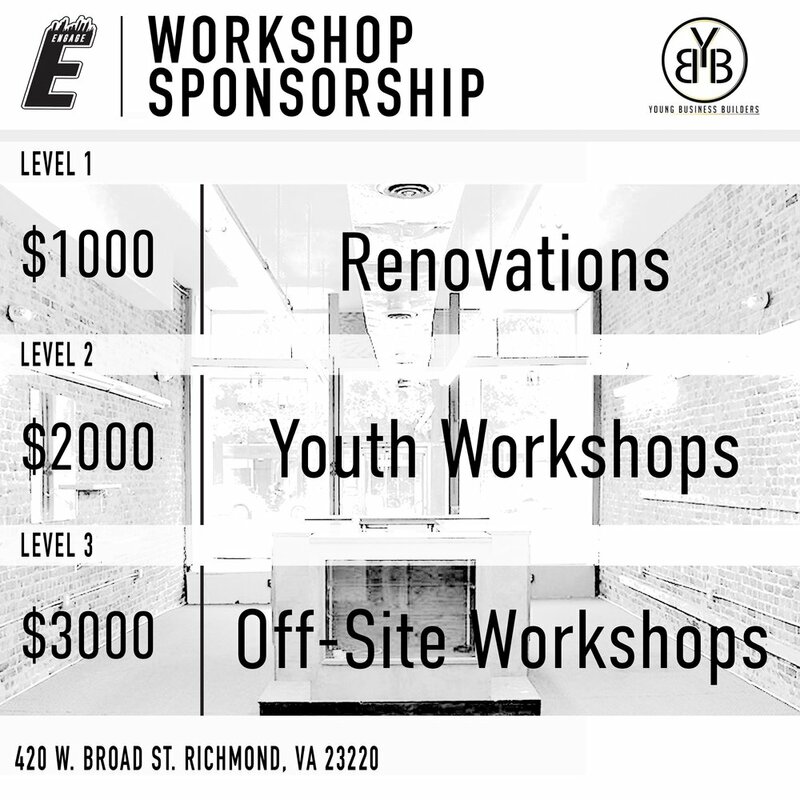 Engage the Foundation is launching a the Young Business Builders program at a new space called Workshop this summer at 420 West Broad Street. The space will be a programmable creative space and boutique available to youth entrepreneurs. Workshop will house an income stream that will fund the Young Business Builders Program to innovate more socially responsible youth driven business. While they already have some pledged assistance from contractors, they need an interior designer to help them outfit their space. The space will house a storefront, meeting space, screen-printing set up, and a photography studio in the back. Their soft opening is scheduled for July 3rd with a formal opening in August. Since its’ inception in 2011, Engage, The Foundation (Engage) has focused on connecting communities, schools and universities to resources designed to improve individual stability and family structure. Through the Young Business Builders Program, they equip youth and families with the tools needed to turn passions into profit through training certifications, education and mentorship. Community members, participating college students and recent graduates have become linked with a diverse network of professionals who work with them on achieving their career aspirations in a socially responsible manner. 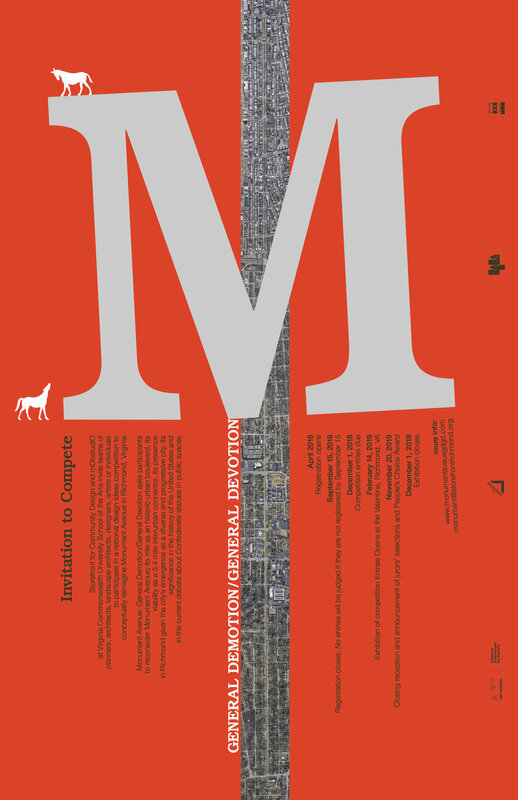 Storefront is proud to be recognized for the Monument Avenue: General Demotion/General Devotion Design Competition in the Monument Avenue Commission's Report to Mayor Stoney about the re-contextualization of the statues on Monument Avenue. You can find a copy of the report here. Recent national events provide an opportunity to re-examine the role of Confederate statuary in the public realm. Monument Avenue: General Demotion/General Devotion is an international design ideas competition, aiming to contribute to this important dialogue by inviting architects, planners, designers, artists, and individuals to reimagine the entire 5.4 mile length of Monument Avenue in Richmond, Virginia, one of America’s grandest boulevards. Local Richmond organizations including The Storefront for Community Design + the mObstudiO at VCUarts will administer the international competition, a concurrent local high school competition, and community workshops and conversations. Monument Avenue provides a unique opportunity to enrich the conversation about race, memory, the urban landscape and public art. Competition registration is now open and remains open until September 15, 2018 with submissions due on December 1, 2018. The Valentine (https://thevalentine.org/), a history museum in Richmond, will host an exhibition of entries opening on February 14, 2019. Please share this announcement widely with students, colleagues, firms, studios, community organizations, and anyone else who might be interested. Forest Hill Park contains a couple historic buildings in need of roof repairs. These are the Old Stone House and stables in the the park. Storefront will help direct the conversation within the community to make sure that all facets of these historic sites are told. The Old Stone House in Forest Hill Park. On Saturday April 29th, Highland Park residents joined us for the Highland Park Spring Break Event. The event featured 8 different non-profit organizations working within the community. The goal was to engage with community members about how they might envision the growth of their neighborhood, to describe the resources these organizations offered, and most importantly to eat, dance, and perform in the talent show. At least 100 people showed up to dance, hear about the Storefront for Community Design, Groundwork RVA, Saving Our Youth, the CPDC, LISC, and Tricycle Gardens. On display in the 6PIC space were plans for architectural plans for local business improvements that community members voted on. The day was unusually hot but that didn't stop the talent show from continuing! Storefront is seeking volunteers to propose a redesign the storefront of Miracles store in Church Hill. Do you have an idea for new signage, a color scheme or something to make this shop stand out? Contact Adele (adele@storefrontrichmond.org) if you are a designer interested in this storefront improvement project. Our neighbor in Highland Park, Ms Minor Young is in need of your landscaping and erosion engineering advice. This house has been in her family since the 1970s and is situated just at the edges of Richmond City and Henrico County. In the past year, the ravine in the backyard has begun encroaching on the house. Storefront is seeking an architect or engineer to assist the property owner in developing a plan of action for her yard. She is also seeking a landscape architect who may aid her in identifying and replacing invasive species with new and native trees and shrubs.